All Aboard The JLA Royal Express! Description: All aboard! Are you ready for the JLA express? Brand new trackless train rental in new jersey. Our train is fully insured, registered and inspected by the State of New Jersey as required by state Law. We have many types of packages for all different types of events. Give us a call and we can work with you on making your next event fun and memorable. Safety features include; seat belts, lights, train belt, and train horn. Train ride rentals can be used at all different types of event. Our can can be used in Hard or grass even surfaces. We are located in North New Jersey and have a free delivery area that include, Paramus, Wyckoff, Fair Lawn, Carlstat, Ridgewood, and many more areas. 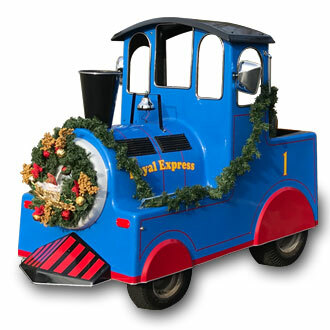 Need a train for your next event then give us a call, our JLA Express trackless train rental is awaiting. To get a quote for our trackless train rental click the quote button and we'll get back to you as soon as possible.